While the Samsung Galaxy Note Edge is unique, its box may as well hold a vanilla Galaxy Note 4. Not that it's a bad bundle - you get a complete set of accessories with no compromises. The included charger puts out 2A to Quick Charge 2.0 compatible devices (like the Note Edge) or "just" 1.67A to unsupported devices. There's a one-piece headset with in-ear headphones and flat, tangle-free cables. The rest of the contents include a microUSB 2.0 power and data cable, plus replacement tips and tool for the S Pen. 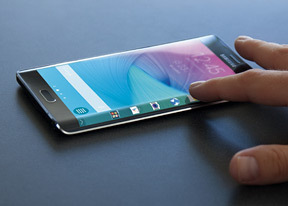 The Samsung Galaxy Note Edge measures 151.3 x 82.4 x 8.3mm - shorter but wider than its Galaxy Note 4 sibling. Which was to be expected, really, considering it has a slightly smaller screen (5.6" vs. 5.7") but the Edge screen adds to the width. It's interesting that Samsung managed to bend screen bend without adversely affecting thickness and weight. In fact, the Galaxy Note Edge is a smidgen thinner and lighter, while maintaining the metal chassis of its flat-screened counterpart. Samsung's designers were imagining flipping a book when designing the Galaxy Note Edge, which is why they placed the Edge screen on the right. For the majority of the population that's okay but lefties may feel left out. Using the phablet upside down is possible in some apps, but not viable for everything - even if Samsung had dropped its hardware keys for on-screen ones, there's still the earpiece and mouthpiece to worry about. A true ambidextrous Edge would've had the screen curved on both sides. For now, it's possible to reach the curved section with your left thumb but it's difficult. This raises the question - when you put a touchscreen on the side, how do you hold the device without touching it unintentionally? Samsung offers palm rejection technology to discard accidental touches, but also the Edge screen often shows info rather than actionable buttons. The Galaxy Note Edge is part of Samsung's H2 2014 premium line - meaning it has an aluminum frame. Like the Galaxy Note 4 it's left uncovered on the sides (with a touch of paint to match the rest of the color scheme). Unlike the Note 4, however, the frame bends on the right side to make room for the Edge screen. That doesn't change the overall premium feel, the phablet feels sturdy, befitting a business device. While Samsung is more popular with the tech crowd, the Galaxy Note and Note Edge have plenty of features to draw in former BlackBerry users who are used to the legendary build quality of the Canadian phone maker. The front of the Note Edge is virtually identical to that of the Note 4. The hardware Home key houses a fingerprint reader and is flanked by capacitive App switcher and back buttons. Above the screen, the setup is identical too, down to the 3.7MP selfie camera. It exactly matches the resolution of the QHD screen and features a bright f/1.9 aperture for better low-light shots. Some change was necessary on the right - the Power key was moved to the top, where it's a bit hard to reach. We would have preferred if Samsung placed it on the left instead or even better, just enabled double-tap to wake. Along with the repositioned Power key, there's a 3.5mm audio jack and an IR blaster on top, along with one of the mics. All the way down is the mouthpiece, which consists of two separate microphones. The three mics are used for Directional voice recording - they are sensitive enough to separate speakers, a trick used in the Voice recording app. The mouthpiece shares the bottom with a regular microUSB 2.0 port - Samsung tried microUSB 3.0 on the Galaxy Note 3 and Galaxy S5, but gave up. We don't miss the clunky connector, USB 2.0 with MHL3 and Quick Charge 2.0 handles all our wired needs, data transfers usually go over radio waves these days. Also on the bottom is the S Pen sheath, more on the trademark stylus in a bit. We go around to the back of the Samsung Galaxy Note Edge and here it's even harder to tell apart from its sibling. The new faux leather finish is patterned after Togo leather, which gets often used in premium products (quick Googling shows a lot of handbags, make of that what you will). To the touch it's not quite real leather but is definitely more pleasant than plain plastic (especially Samsung's Glossy Special). The 16MP camera protrudes from the back (nothing out of the ordinary for Samsung). It features Optical Image Stabilization, though it uses a Sony sensor so it lacks the phase-detection autofocus of the ISOCELL sensor in the Galaxy S5. It still records 2160p video though. Below the camera is a single-LED flash and Samsung's latest heart rate monitor, which also include a SpO2 sensor. That's blood oxygen saturation in plain English, another important factor in health and exercise tracking. The back opens to reveal a 3,000mAh battery - 220mAh less than the Note 4, but the internals of the Galaxy Note Edge are smushed to the side due to the Edge screen, so the battery is physically smaller too. The card slot situation is unchanged though. The microSIM card is blocked by the battery, preventing hot-swapping, but access to the microSD card is unobstructed.